Ang Chen Xiang number #128 being congratulated on his win. 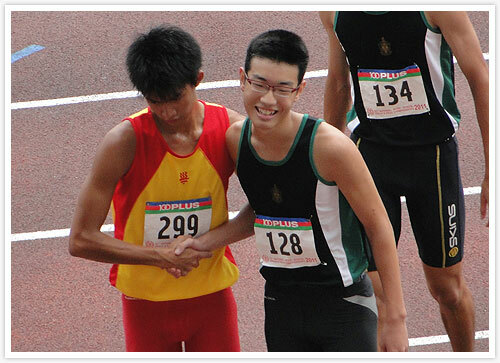 17-year-old Ang Chen Xiang matched Abdul Hakeem Bin Abdul Halim‘s 2005 ‘A’ boys 110m hurdle mark of 14.46 seconds earlier today at the 52nd National Inter School Track & Field Championships 2011. The IAAF World Youth Championship bound athlete cleared the 0.991 meters hurdles with such ease, that it’s not surprising that he is one of two junior athlete who has not only met the qualifying mark for the earlier said competition, but also the upcoming Commonwealth Youth Games, and also the SEA Juniors. Coached by Mr. Melvin Tan, the current national relays coach coordinator, the promising hurdler improved his timing of 14.67 seconds set in the heats early in the morning, by clocking 14.46 seconds in the finals. Prior to this, Ang Chen Xiang has run faster, 14.24 seconds at the SAA T&F series #2. He currently holds top three fastest times ran by a Singapore junior so far this year, for the 0.991 meters hurdles.